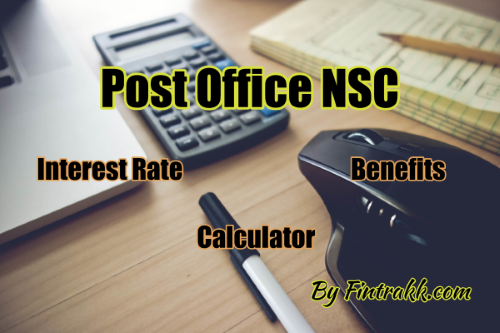 Post Office NSC or National Savings Certificate is a popular investment vehicle. In this post, we look at NSC interest rate chart, Tax Benefits and interest rate calculation. NSC has been into market since early 1950s. The NSC during the beginning was issued with an intention to raise money for helping the development of India. The transition of NSC from fund generating investment scheme to tax saving investment scheme was much later. Now-a-days NSC is a tax saving, risk free investment instrument which are issued and managed by Indian Post offices. The amount invested under this scheme is used for the benefit and development of the country. All Indian resident individuals can open an NSC account. As NSC scheme is an investment scheme only for individual residents thus companies or trusts or Hindu Unified Families (HUF) cannot invest in them. Note: But if the individual was resident at the time of buying the certificate and becomes NRI at the time of maturity, then the same is allowed. How much amount can be invested in NSC? The National Savings Certificate or NSC is generally issued in denominations of Rs.100, Rs.500, Rs.1000, Rs.5000 or Rs.10,000. The minimum amount to be invested under NSC scheme is Rs.100. There is no upper limit restriction for investment under this scheme, whereas the tax benefit is restricted to Rs.1.5 lakh only. How to open an NSC account? The interested individual must obtain and fill the NSC application and submit the same in post office. Along with application, the individual needs to provide self-attested copy of identity proof and address proof for opening the NSC account. The individual needs to provide the amount which he or she wants to invest, this amount one wants to invest can be contributed in cash, bank transfer or demand draft. Note: One can download the NSC application online or can obtain a copy from post office. Any contribution made under the NSC scheme, an individual can claim tax benefit up to a limit of Rs.1.5 lakhs in a year as Deduction under Section 80C of Income tax act. Along with the invested amount, any interest earned on the investment (except for the interest earned in last year) can also be claimed as tax deduction under section 80C up to an overall limit of Rs.1.5 lakhs. The rate of interest to be earned on NSC certificate is decided by the government. The rate of interest is generally provided each year by 1st April. The NSC issued at the specified rate for that period. Once NSC issued at specific interest rate, then the rate of interest would not change till the maturity date. NSC Interest Rate for Quarter 1st April’19 to Jun’19 is 8% per annum compounded annually. The 5-year NSC interest rate for quarter Jul’18 to Sept’18 was 7.6% only. For the quarter Oct’18 to Dec’18 the NSC interest rate was increased to 8% p.a. The same continued for quarter Jan to March’19 as well. The rate of return on NSC scheme is unaffected by inflation or market movement as the rate of interest doesn’t change for the whole lock-in period. This feature enables the investor to not only mitigate the market fluctuation risk but also remain the scheme unaffected in moving inflation rates and government policies. There are many online calculators available for the said calculations and once you key in all the details in any online or offline NSC Calculator, the maturity period total would be provided. Single Holder Type Certificate: Single Holder Type certificate, as the name suggests are the certificates issued to single individual in case of single holding of NSC scheme account. Joint ‘A’ Type Certificate: Joint ‘A’ Type certificate is a certificate used in case of joint NSC account holding. This certificate is issued to two adult holders of joint NSC account. Under this holding scheme, the amount at the time of maturity is payable to both. In case of nomination, transfer or cancellation of NSC account signature of both the account holders is required. Joint ‘B’ Type Certificate: Joint ‘B’ Type certificate is very much similar to A type joint certificate. Under B type holding also the NSC investment certificate is issued to both the joint holders. These joint holders have 100% eligible for managing the certificate. The only difference under this scheme of certificate is that at the time of maturity the amount is paid only to one of the holders. ALSO READ Current and Upcoming IPOs in India: Latest list! There are two types of NSC certificates which are issued by Post office. NSC Issue VIII certificate are issued for a period of 5 years. The interest earned under this scheme is comparatively lower than the certificate once offered for Issue IX. NSC Issue IX certificate are issued for a period of 10 years. The interest earned under this scheme is comparatively higher than the certificate once offered for Issue VIII. Where NSC holder has passes away. Where the NSC holder of the certificate has forfeited the amount by making a pledge. If the withdrawal procedure is initiated before the completion of a year from the date of enrolment under NSC scheme then: the investor will receive only the invested amount. No interest value would be paid. If the withdrawal procedure is initiated after the completion of a year but before the third year from the date of enrolment then simple interest earned on investment amount would also be paid along with all amount invested under the scheme. To learn more about other Post Office Schemes, you may have a look at Post Office Saving Schemes in India. Transfer from one post office to another: In cases where the NSC holder is moving from one place to another and the holder won’t be able to manage the NSC investment due to location constraint. Then the post office can allow the inter location post office transfer of the NSC account. The investor needs to provide transfer application at either the old or new Post office requesting for the transfer. In such cases where a court order has been passed. In case the NSC scheme certificates are lost or damaged or misplaced one can also apply for duplicates certificate copy. The Post office official may provide duplicate copy after verifying and validating all document proofs and application submitted by the NSC holder. Thus NSC investment scheme provides the NSC holder with a safe a risk free instrument. This provides guaranteed return on investment and the holder can also claim tax benefit deduction on making such investment. These 3 mentioned features makes NSC one of the popular secure investment scheme currently available in market. Hope you are clear about the Post Office NSC Scheme now. Which investment alternative do you prefer? Are you a safe player or you like exploring riskier asset classes? Do share your opinion in the comment section. Hi, I lost my NSC certificate. So, please tell what is the correct process for getting duplicate certificate.